above image: SUT-TAMU Board Members with the volunteer industry representatives. 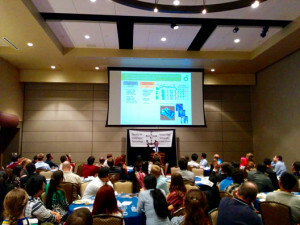 The Society for Underwater Technology TAMU Student Chapter hosted its annual Welcome Dinner for over 100 of its student members in the Memorial Student Center with invited industry representatives from SUT-Houston. Colleges from every aspect of the University, including Geosciences, Engineering, Archeology, and Business, were represented that evening, demonstrating the multidisciplinary nature and uniqueness of SUT-TAMU. To begin the evening, the three 2015 Student Paper Contest winners were acknowledged and awarded $1,500 from SUT-London. The winning papers were selected among many high-quality papers submitted in the areas of Engineering, Science, and Technology by volunteers at SUT-Houston. The 2015 Student Paper Contest winners were Mr. Ahmad Abdullah in Engineering, Ms. Lindsay Martin in Science, and Mr. Kewei Chen in Technology. Dr. Medina Cetina, Associate Professor of Civil Engineering and SUT-TAMU Academic Advisor, read a message from Dr. Bob Allwood, CEO of SUT headquartered in London, congratulating the Student Paper Contest winners and recognizing the achievements of SUT-TAMU. Mr. Christopher Curran, BP Advisor and HIPPs and Subsea Controls Engineer for Deepwater Facilities, then gave a keynote presentation on the current underwater technology and procedures related to deep sea drilling with two case studies in the northern Atlantic Ocean. Following the presentation, students discussed the current and future opportunities of underwater technology as well as personal experiences with the many emerging and established industry representatives from SUT-Houston. Mr. Christopher Curran giving his presentation at the 2015 Welcome Dinner. SUT-TAMU is a multidisciplinary student organization that works towards building a bridge between students and industry experts in the field of underwater technology, providing education and professional opportunities to its members. The TAMU student chapter was the first of its kind within the United States and, with the support of SUT-London and SUT-Houston, continues to gain momentum within the university as student membership grows. SUT-TAMU is thankful for the volunteers who came and talked with students about their careers and provided advice to the next generation of subsea engineers and industry members. Specifically, a warm thank you is given to Mr. John Allen, President of Intecsea, Mr Roger Osborne, Senior Consultant for Ocean Flow International, Mr. Mark Siegmund, Subsea Systems Engineer and Wells Reliability Advisor for BP, Mr. Logan Brant, Project Geotechnical Engineer for Geosyntec, Ms. Nicole Otten, FMC Technologies Design Center Manager, Mr. Neil Manning, CEO of SLAM Group, Mr. Eric Sears, Technical Supervisor at the College Station Design Center for FMC Technologies, and Mr. Alan Foley, President of Svitzer Surveys.